The growing popularity of methamphetamine over the past 15 years has increased the risk of exposure to the surrounding community and law enforcements personnel. Methamphetamine is a controlled substance that is “cooked” using many common household ingredients (refer to Enclosure A) which can be volatile and generates by‐products that can be very harmful to humans. When these products are combined, they emit toxic fumes and may cause chemical burns upon contact. Toxic residue from the cooking process saturates every surface and can remain there for months or years if not properly sterilized. Since the chemicals can be inhaled, ingested, or absorbed through the skin, everyone coming in contact with those surfaces is vulnerable. Acute exposure occurs over a relatively short time and produces symptoms that include: shortness of breath, cough, chest pain, dizziness, lack of coordination, chemical irritation, and burns to the skin, eyes, nose, or mouth. If toxicity levels are fairly high or a person is particularly vulnerable (i.e. pre‐existing breathing problems), acute exposure can cause death. Less significant exposure can result in headaches, nausea, dizziness, fatigue, or lethargy, and can lead to other long‐term health problems. Despite being comprised of dangerous chemicals, methamphetamine is synthesized relatively easily and can procure a significant profit for the distributor and a steady supply of the drug for users. These facts have made methamphetamine manufacturing operations the most frequently encountered clandestine laboratories in the United States. Methamphetamine can be produced using several methods with “recipes” that are readily available on the Internet. The most common processes utilize ephedrine or pseudoephedrine and are known as the Red Phosphorus method or the Birch/Nazi method. The Red Phosphorous method combines ephedrine, red phosphorus (typically from matches), iodine crystals, and other ingredients to produce methamphetamine. The Birch method uses ephedrine, anhydrous ammonia, lithium metal, and other ingredients to produce the drug. An adaptation of this technique, known as the “One‐Pot” method, has become increasingly popular as it can be easily transported and produces the methamphetamine faster. The One‐Pot method substitutes ammonium nitrate for anhydrous ammonia, which can be more difficult to obtain. This approach is of great concern as it is highly flammable and explosive; it can also resemble plastic, urine‐filled bottles discarded along roadways, in garbage bins, or other areas. The presence of solid material in the bottom of the bottle is the best way to differentiate between the two. 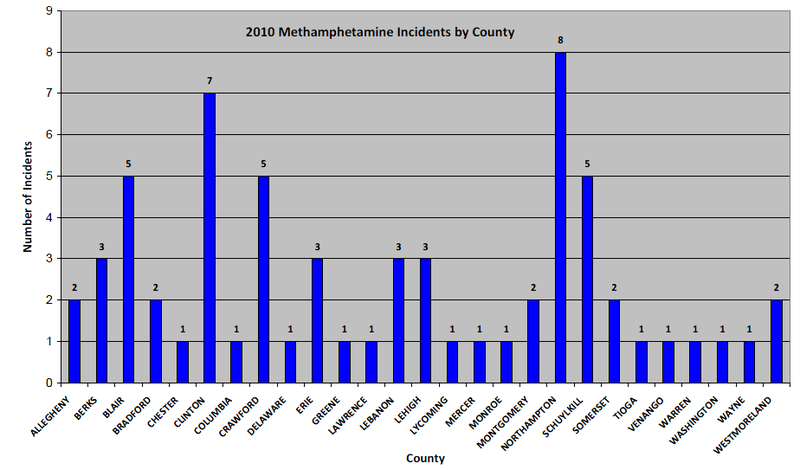 The table to the right illustrates the growing number of methamphetamine laboratories found in Pennsylvania in the past three years. 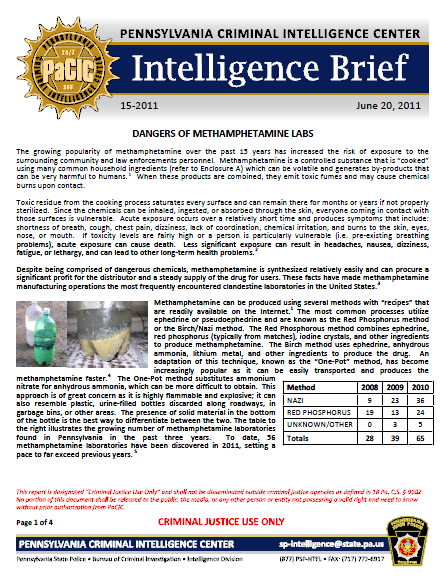 To date, 56 methamphetamine laboratories have been discovered in 2011, setting a pace to far exceed previous years.